This section describes how to remove attributes and index types from the index. Removing system indexes can significantly affect the Directory Server performance. If you do not remove the attribute from this entry, the index for the sn attribute is automatically recreated and corrupted after the server is restarted. For further information about using the db2index.pl Perl script, see the db2index.pl(8) man page. The Directory Server Console can delete any custom indexes, indexes used by other server applications such as a messaging or web server, and default indexes. If the attribute to remove is listed in the cn=default indexes,cn=config,cn=ldbm database,cn=plugins,cn=config default index entry, remove it from this entry first. For details, see Section 13.7.1, “Deleting an Attribute from the Default Index Entry”. Expand the Data node and expand the suffix associated with the database containing the index. Select the database from which to delete the index. 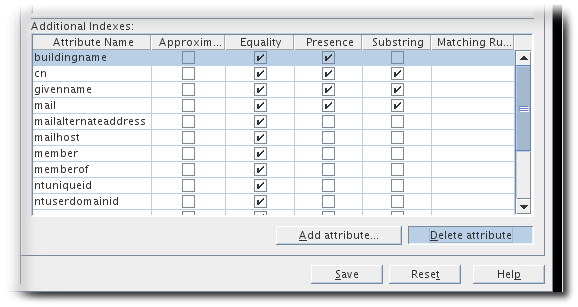 Locate the attribute containing the index to delete. Clear the check box under the index. To delete all indexes maintained for a particular attribute, select the attribute's cell under Attribute Name, and click Delete Attribute. A Delete Index warning dialog box opens, requiring a confirmation to delete the index. Click Yes to delete the index. If the attribute to remove is listed in the cn=default indexes,cn=config,cn=ldbm database,cn=plugins,cn=config default index entry, you must remove it from this entry first. For details, see Section 13.7.1, “Deleting an Attribute from the Default Index Entry”. After deleting the entry, the index for the sn attribute is no longer maintained. Run the db2index.pl Perl script to recreate the index. After deleting the index entry, the substring index for the sn attribute is no longer maintained. 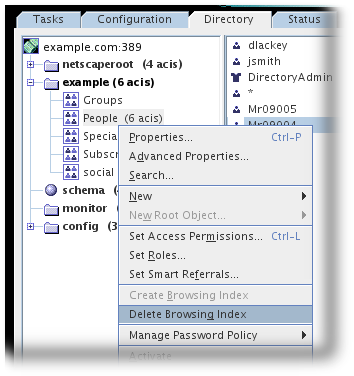 Select the entry from which to delete the index in the navigation tree, and select Delete Browsing Index from the Object menu. Alternatively, select and right-click the entry of the index to delete in the navigation tree, and then choose Delete Browsing Index from the pop-up menu. A Delete Browsing Index dialog box appears asking you to confirm the deletion of the index. Click Yes. The Delete Browsing Index dialog box appears displaying the status of the index deletion. Using the ldapdelete to delete browsing index entries or edit existing browsing index entries (Section 13.7.6.1, “Deleting a Browsing Index Entry”). Running the vlvindex script to generate the new set of browsing indexes to be maintained by the server (Section 13.7.6.2, “Running the vlvindex Script”). Alternatively, launch an appropriate task under cn=tasks,cn=config (Section 13.4.2.3, “Using a cn=tasks Entry to Create a Browsing Index”). The actual entries for an alphabetical browsing index and virtual list view are the same. The following sections describe the steps involved in deleting browsing indexes. Use the ldapdelete command-line utility to either delete browsing indexing entries or edit existing browsing index entries. To delete browsing indexes for a particular database, remove the browsing index entries from the cn=index,cn=database_name,cn=ldbm database,cn=plugins,cn=config entry, where cn=database_name corresponds to the name of the database. For example, there is a browsing index for accelerating ldapsearch operations on the entry ou=People,dc=example,dc=com. It held in the Example1 database where the search base is ou=People,dc=example,dc=com, the search filter is (|(objectclass=*)(objectclass=ldapsubentry)), the scope is 1, and the sorting order for the returned attributes is cn, givenname, o, ou, and sn. Run ldapdelete, specifying both entries. # ldapdelete -D "cn=Directory Manager" -W -p 389 -h server.example.com -x "cn=MCC ou=People dc=example dc=com,cn=userRoot,cn=ldbm database,cn=plugins,cn=config" "cn=by MCC ou=People dc=example dc=com,cn=MCC ou=People dc=example dc=com,cn=userRoot,cn=ldbm database,cn=plugins,cn=config"
After deleting the two browsing index entries, the browsing index will no longer be maintained by the Example1 database. After deleting browsing indexing entries or unwanted attribute types from existing browsing indexing entries, run the vlvindex script to generate the new set of browsing indexes to be maintained by the Directory Server. After the script is run, the new set of browsing indexes is active for any new data added to the directory and any existing data in the directory. Alternatively, create a new task entry under cn=index,cn=tasks,cn=config to initiate an indexing operation. This task entry requires a unique name (cn) and one other attribute, nsIndexVLVAttribute, which gives the name of the browsing index definition entry to use to generate the VLV index. This task is the same as running vlvindex.